there are quite a number of restaurants to eat at Publika, Solaris Dutamas，Fatboy’s Burger Bar is a Singaporean brand and this outlet at Publika is their very first in Malaysia. The interior of the restaurant reminds one of a cafeteria (an exclusive, artsy cafeteria where only cool kids are allowed to sit) with glossy white tables and black plastic chairs. The walls and glass windows feature black-and-white silhouettes of Pac-man like monsters waving pitchforks, robots, curving arrows, butterflies and birds. All in all it is a pretty surreal-looking piece of artwork, blending in perfectly with Publika’s edgy artistic vibe. 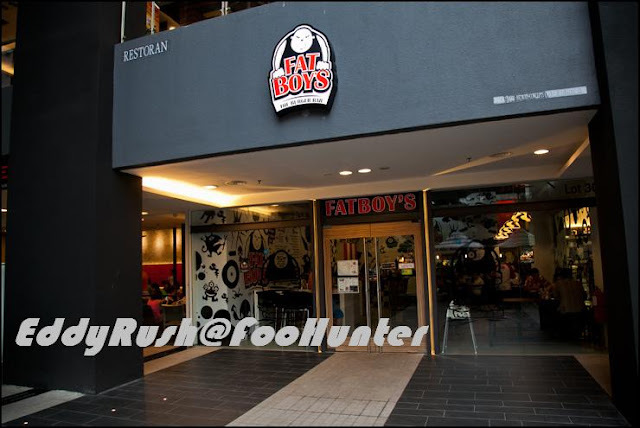 Those who are not keen on burgers can opt to sample one of the dishes from Fat Boy’s Burger Bar’s Best of the Rest section of the menu a thick and juicy slab of crispy, herb marinated meat drizzled with cheesy béchamel sauce and served with a heaping of mashed potatoes and coleslaw. you can build ur own burger by ur own choice...some thing fun here huh! !